Wouldn't you love the opportunity to search from a wide selection of quality Commercial Windows Los Angeles? When you go through Intex Windows & Doors, that is entirely possible. We make it easy for our customers to shop for innovative and unique fixtures for commercial and residential purposes. Milgard is one of our top brands that we distribute, though we also have a broad variety of products from companies such as Jeld-Wen, Fleetwood, PRL Glass and more. You can find your windows, doors and any necessary hardware to complete your project, all from one convenient place. The categories are laid out in an accessible way, so you can pick through and narrow down what you want from the extensive selection. We want you to have the advantage of choice without having to go through an ordeal to find your perfect fixtures. Many companies do not offer the high level of convenience that is a part of our website, which is crucial to how you shop and order. We always offer superior customer service from trained professionals who care about your needs and are dedicated to meeting them, no matter the size of your project. Intex Windows & Doors lets you select the Replacement Windows Studio City you need to switch out old or damaged windows. If you do need to replace them, it's important to know what kind of process you need to follow in order to do it. Many towns have zoning codes that you have to adhere to, which Intex is fully aware of and can inform you of what steps to take. We help you with many of the steps of this process that can otherwise be a hassle to people who are not used to it. You will want to have everything in place to avoid any consequences of being found installing windows without meeting the guidelines. It can be costly and frustrating to have to start all over again and possibly have to pay fines. We want to keep the stress levels minimal when it comes to doing home renovations as they are already stressful enough. With help from the trusted staff at Intex, you can be well on your way to getting your dream windows in no time at all. 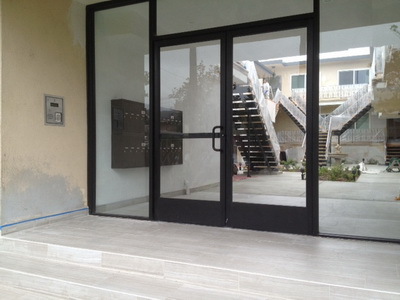 If you have a commercial building for which you need new Commercial Windows Los Angeles, we would love to help. Put in some time now to shop around the website, talk to a specialist and make sure that the windows you are getting are just right for your space, so that you don't have to worry once you get the windows installed. You might request a quote by submitting a form, or you can call with your questions and concerns before you make your purchase. The last thing you want is to get your order and find that it's not the right size or shape, or that it is not ideal for the climate in the area where you live. In fact, many of the windows that we sell are made to be energy efficient, complying with the high ENERGY STAR standards to keep you comfortable no matter what it is like outdoors. The innovative windows and other products from Intex can make all of the difference in your residential or commercial building project. We offer affordable products that are durable enough to last for many years, which helps you to save even more money and time. If you are entirely new to shopping for home or commercial fixtures, it is a good idea to shop from our company to get the full experience of quality customer service from staff that is knowledgeable and compassionate to your needs. Learn more about our business and our satisfied customers by reading the many testimonials offered and you will know that you are making a good choice. Give us a call right away to get started. We know how important it is that you make a good impression with your customers. That is why we have lots of customers selecting our Commercial Windows in Los Angeles for their store front or commercial buildings. Each and every one is high quality and long-lasting. You will never have to worry about how our products are going to hold up in the long run. If you are in any doubt of the products and services that we provide, you can view the many testimonials of happy customers that we have gained since we opened our business in 2004. Get Milgard or Fleetwood windows and/or doors. If you have offices and want to keep out the outside noise of a busy city street, we can help you find the right Sound Control windows for your needs. If you do not want to go that route, you can select another attractive choice among the wood, vinyl, aluminum, fiberglass and other types of materials that we have to offer you. Whenever you are in need of great Replacement Windows Studio City to take the place of your older or broken current windows, let Intex Windows & Doors be your one-stop source. We have got several different Series available from which you can choose, including the Essence, Quiet Line, Tuscany, and Ultra Series. Each of these have their own unique benefits, so you will want to read over all of the qualities of the styles so that you know what you are getting. We are a top dealer of Energy Efficiency Doors and Windows In Glendale. This is sure to be an ideal advantage for many people who are seriously wanting to cut back on their energy bills. Another benefit is that an installation professional from Intex will come to you and do a quick installation of your Commercial Windows Los Angeles so that you do not have to worry if you have done it completely right. Get ahold of the company if you need to make any requests or ask questions.